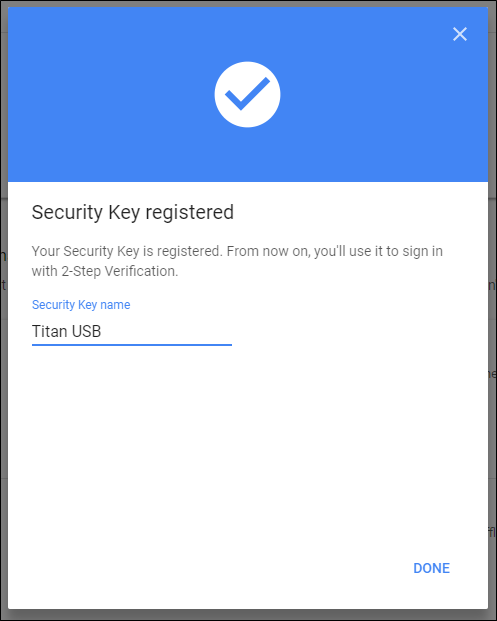 Google recently released a set of two-factor authentication (2FA) security keys called the Titan Security Bundle. This set includes a traditional USB-based Universal Second Factor (U2F) key for use on a computer and a combination Bluetooth/USB key for mobile. Here’s how to get it all set up. So What is the Titan Security Bundle? Most of the time when you buy a U2F key, you get one key to use everywhere. While this is by far the safest way to secure your accounts, what happens if you lose that key? It’s not world-ending or anything, but still—it’s not great, either. 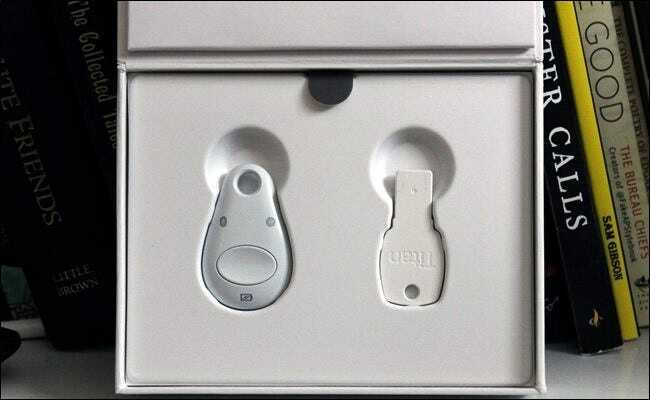 That’s where Google is making a smart move with the Titan Bundle: it comes with two keys. After adding both keys to your account, you can then toss the USB key in a drawer as a backup and keep the USB/Bluetooth key with you since it will work on both computers and mobile. Plus, at only $50, you get a pair of keys for the same price as most standalone Bluetooth keys. If you lose your Bluetooth key, you still have a solid backup. Since your keys store no data locally, your account security isn’t compromised in any way if you lose a key. First off, let’s make one thing clear: these are standard U2F keys that will work on any account that supports authentication via security key—this includes, but is not limited to, Google accounts. That said, for this tutorial, we’ll look at securing a Google account with these keys. Just keep in mind that the same process will work (more or less) for any account that supports U2F. 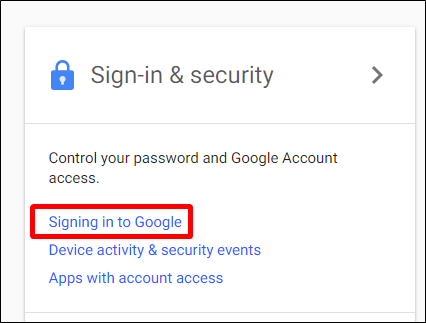 To get started, head over to your Google Account page and then click on the “Signing in to Google” link. 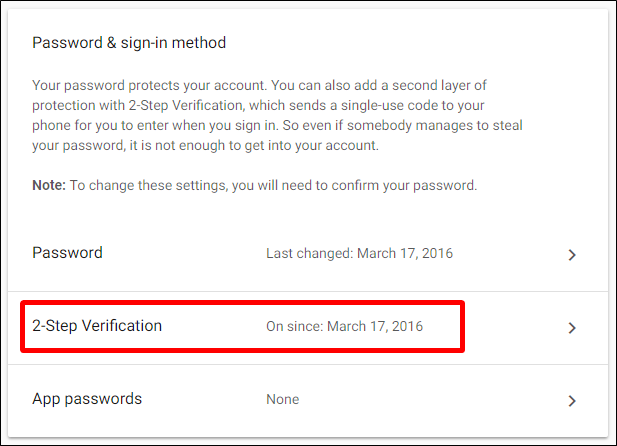 On the Password & Sign-In Method page, click the “2-Step Verification” option. You’ll be prompted to sign in to your account. If you don’t have 2FA set up, go ahead and do that now. 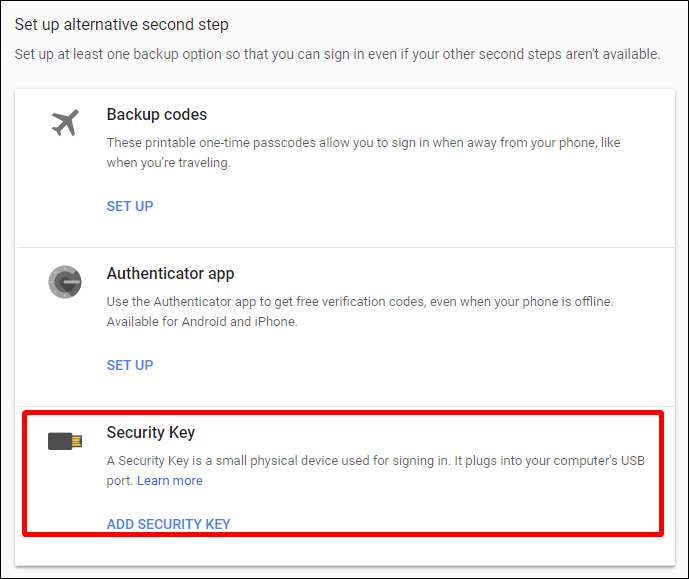 If you do already have it set up, scroll down to the “Set Up Alternative Second Step” section, find the “Security Key” section under that, and then click the “Add Security Key” button there. A window pops up asking if you have your security key. Click “Next” to get started. It will then ask you to connect your key. I’m using the USB-only key, but this part works the same for both types of keys. Connect the key over USB and press the button on it. If you’re using Chrome, you’ll get a request from the browser to access the key. Go ahead and click the “Allow” button. At that point, you’re finished. Go ahead and do the same thing to add the Bluetooth key. When it asks you to connect the key to your computer, do it over USB, then press the button just like with the USB-only key. Once the Bluetooth key is paired to your account, it will work over Bluetooth with your mobile devices—no need to involve a USB cable there. When you’ve added the Titan Keys to an account, you’ll be prompted to use them every time you try to sign in to that account on a new device. While using the USB key is pretty straightforward—plug it in and press the button—the Bluetooth key on mobile can be a bit of a mystery if you’ve never used one before. Let’s say you’re signing in to your account on a new Android device. After you type your Gmail address and password, you’ll be asked to verify your account with your security key. To do this, you’ll need to pair the key with your phone. The phone will prompt you to pair your Titan Key. Tap the “Next” button and then long-press the button on your key until the Bluetooth button starts to blink. The phone should then find the key, which will show up in a list. Make sure the name on the back of the key matches what your phone is showing and then tap it. It will then prompt you for the PIN—this is also printed on the back of the key, just above the device ID name. Type the PIN and then tap the “OK” button. The key should now be paired and confirmed, and you’ll immediately be signed in to your account. You can use the Titan Keys on any account that supports U2F, but it’s worth keeping in mind that some accounts—like Twitter, for example—only let you add one key. In that case, we suggest adding the key you’ll most likely have on you, which should be the Bluetooth option. It’s the most versatile of the two keys, as it easily works on both a computer and on mobile, over either USB or Bluetooth.